The Sabra marque was a sports car project of the Autocars Company Limited, which was based in Haifa, Israel in the 1950s and 1960s. While the parent company produced basic sedans and wagons under the Autocars brand with support from the Reliant Motor Company in Britain, the Sabra Sports and Sports GT were intended as halo cars for the manufacturer. The word Sabra generally indicates a native Israeli. 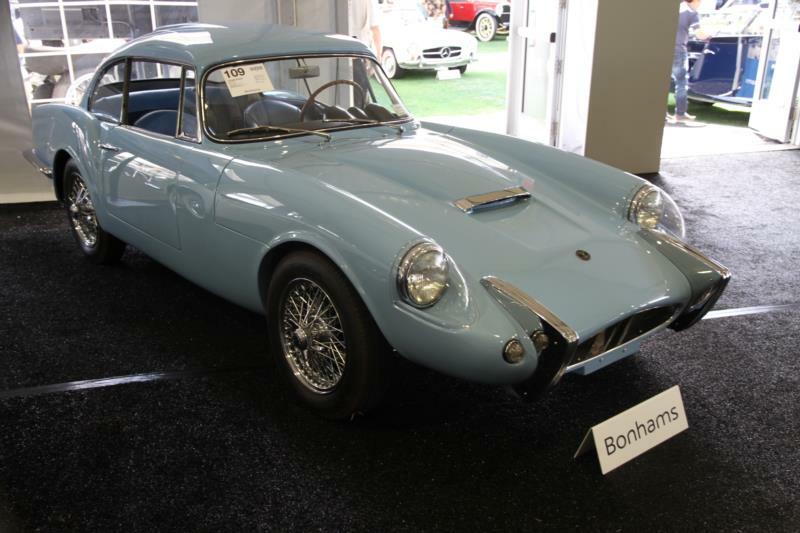 The Sabra Sports was based on a British chassis, with body molds also sourced from Britain and a British Ford drivetrain. In fact, a majority of the cars were actually assembled in Britain, with just a few put together in Haifa. The Sabra Sports was a two-seat convertible that featured all fiberglass bodywork hung on a box steel chassis. The Sabra Sports closely resembles the competing Elva Courier, but with more elaborate contours to the bodywork. Large vertical front bumpers wrapped around a protruding nose, and a large power bulge dominated an otherwise low-lying hood. At the rear, wrap-around bumpers also highlight fin-like rear fenders and a sloping trunk space. Roll-up windows and a curved windscreen enclosed a large cabin for the car’s size. The Sabra Sports GT featured a rounded full-height fastback coupe design similar to the lines of a Triumph Stag coupe. Engine power came courtesy of a 104 cubic inch (1.7-liter) inline 4-cylinder engine derived from the British Ford Consul sedan. The base engine for the Sabra Sports used a 7.8:1 compression ratio to deliver 61 hp and 91 lb-ft of torque, but an upgrade engine was used in the GT. While displacement remained the same, the Sports GT engine boosted compression to 8.9:1 to achieve 110 hp and 98 lb-ft of torque. Total weight was just 1,756 pounds for the Sabra Sports and 1,950 for the Sabra Sports GT, so this translated to 0-60 times of about 16.5 seconds and a top speed of 99 mph. The Sabra Sports covered the quarter mile in a leisurely 22.6 seconds at 70 MPH, but advertised fuel economy of 28 mpg. The transmission was also a British Ford unit, with four fully synchronized gears in a front-engine, rear-drive configuration. The rear suspension was a standard solid rear axle with coil springs and a watts linkage, while the front offered a dual-wishbone design with coil springs. Front disc and rear drum brakes provided stopping power, and steering was rack and pinion. Production numbers are not reliably known for the Sabra Sports and Sabra Sports GT, but best estimates are that about 185 cars were imported to the United States. Just a handful remain, and at least one of those is active in vintage racing. Collectors should look carefully at condition and completeness when evaluating one of these obscure cars. The fiberglass bodywork is likely to require customized attention. Engine and driveline parts should be readily available, but other components may be difficult to locate. Note that the Reliant Sabre shares many components with the Sabra Sports, and an internet-based community for Sabra Sports owners does exist.